Stamina elliptical trainers are made by Stamina Products Inc. which was founded in 1987. They’ve been manufacturing leisure fitness and infomercial products in markets that include catalogs, retail stores, online websites, and on TV shopping networks. You may not have heard of Stamina elliptical trainers but you’ve seen dozens of products manufactured by Stamina. They have a large market share in exercise equipment and are the folks behind infomercial products, including the American Gladiator® Home Gym, Pilates Performer™, InStride Walker®, Gyrotonic®, and Body Dome™, all in the Stamina brand. They also make other fitness equipment brands such as Body By Jake®, Suzanne Somers, Tony Little, Denise Austin, and BodyShaping®. Stamina’s line of elliptical trainers covers a wide range of budget through middle range price classes from $149 to $599. If you’re just starting out in fitness and need a beginner machine, or you’re hoping to add an elliptical to other cardio equipment in your home gym, a Stamina elliptical will likely be a good choice for you. While the models above $500 don’t hold up well when compared to best sellers such as NordicTrack, Stamina’s low end models are very impressive. Not only does Stamina offer one of the heaviest and most stable units in the sub-$500 budget range, these elliptical trainers offer a bunch of cool features from heart rate monitoring to multiple pre-set programs and resistance levels. The current lineup consists of several InMotion ellipticals and Compact Striders with and without handles, as well as the popular Avari Magnetic Elliptical and Compact Trainer. It seems that they are wisely moving away from the more expensive machines, with most of the current models at or under $200, except for the Avari Magnetic which we've seen at around $599 on sale. Reviewers like Stamina’s budget elliptical trainers overall and generally only nit-pick on one or two small points. For example, the cheapest of the models is stuck with a too-short 14" stride length which for a smaller person isn’t a problem. Otherwise, the price, quality, and extensive features make purchasing one of the budget models a solid choice. Stamina ellipticals are well-made little units and we will definitely be comparing these models head-to-head with some of the best sellers we’ve been recommending for the past two years. Keep in mind that you can’t expect too much from a budget machine, but the line of Stamina elliptical trainers is worth a look. 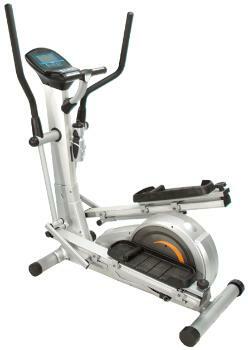 Stamina InMotion E1000 Elliptical - Easy to set up, very quiet, sturdy, and convenient to store out of the way. Stamina 1772 Crosstrainer - A budget trainer with a small footprint that will easily fit into your bedroom or apartment. Stamina 1773 Crosstrainer - A good-looking budget model designed for light workouts. Stamina Avari GX8 - The Avari GX8 has been rated by Consumer Reports magazine as one of the best quality, best-priced ellipticals in its class. Great value if you can find it for under $600. Stamina 55-2065 Elliptical/Stepper - A great buy if you can get it for $600; gets good reviews from equipment pros as well as some very happy owners. Stamina Air Resistance Cross Trainer - Numerous design flaws; elliptical reviews on this model are brutal. Stamina Dual Action Elliptical - A decent budget trainer but should only be ridden by lightweight users (under 175 lbs).